Does the thought of setting your morning alarm an hour earlier make you want to hit the snooze button, pull the covers over your head, and not even think about exercising? If you are one of the many people who can’t imagine waking up earlier than you already do just to fit in a workout, you’re not alone. I used to be one of those people too; that is until I started working full-time. Impromptu happy hours, last minute meeting and project deadlines led me to quickly abandon my evening exercise routine. Unfortunately there was no denying the effects my new “non-exercise” routine was having on my body. Not to mention my energy levels plummeted about as quickly as my healthy eating habits. Determined to get my health and energy back, I started adding early morning workouts two days a week. I will be the first to tell you this was far from easy and took more disciple than I thought I had. The key to creating my routine was implementing small, but attainable goals one at time and determining my “why” for exercise. After a couple months, my early alarm didn’t make me want to bury my head in the pillow. Instead, it provided me with the energy I needed to be my best throughout the day, motivation to eat healthy, and the satisfaction of doing something good for my body. Start small: going from zero days of early morning workouts to attempting to do five days in a row is a recipe for failure. Your body will become exhausted due to the major change in your sleep schedule and your motivation will plummet. Instead, start by adding 1-2 morning workouts in your week at a time. On the nights before, plan to go to bed 30-45 minutes earlier to make up for the change in your wake time. Prepare the night before: set out your workout clothes, prep the coffee pot, and plan your pre-workout snack the night before. That way you have no excuse to hit the snooze button and skip your workout. Get into a routine: let’s face it, sometimes our brains are just not working before the sun rises. Having a go-to morning routine will make getting up earlier much easier. For example, set your alarm for the exact time you want to get up instead of hitting the snooze button. Since you prepped the coffee pot the night before, walk into the kitchen and hit the “on” button, then go to the bathroom, get dressed, eat your pre-workout snack, brush your teeth, and go. Whatever the routine is, find one that works for you and it will make the transition to morning workouts more seamless. Have a plan: nothing kills motivation more than failing to have a workout plan. To be the most efficient with your time, have a purpose for your workout and create your plan before you start. That may mean looking up the group exercise class schedule and planning which morning classes you want to attend. Or, you might find it easier to do cardio rather than strength training early in the morning so you decide to save your strength training days for after-work rather than early in the morning. Creating your workout plan will help you develop consistency and motivation to continue with your routine rather than abandon it. Reflect: the first week or two will be difficult, but if you are consistent and stick with your routine you will soon notice how much better you feel and how much your energy level increases. Reflect on how you feel halfway through your early workout and the rest of the day to keep up your motivation and your commitment. 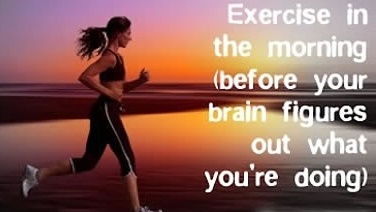 I agree about morning exercising! When I got home from work, I either MUST work out the second I get home (which never ends up happening) or I risk the possibility of sitting down on the couch and never getting off of it the rest of the evening (which usually does end up happening). This spring I started waking up early three days of the week to do my workout routine at home. On those days, I noticed I felt more productive and outgoing at work, and I noticed I drank more water during the day than usual. I hadn’t even realized before then that I wasn’t drinking much water! Whoops! The last month and a half of school was stressful for me – I’d stay there until 7:00 at night sometimes, so I’ve let my workout routine slip away from me. Oh, the shame! Now I’m inspired again to start back up! No excuses now….I’m a stay-at-home-dog-mom for the next two months!